Tablets and wireless networks are expected to show highest growth rates through 2017. December 5, 2013 -- Total worldwide production value of electronic systems is projected to increase 4% in 2013 to $1.41 trillion and climb to about $1.74 trillion in 2017, which represents a compound annual growth rate (CAGR) of 5.0% from $1.36 billion in 2012, according to IC Insights’ new 2014 edition of IC Market Drivers—A Study of Emerging and Major End-Use Applications Fueling Demand for Integrated Circuits. The 475-page report shows cellphones overtaking standard personal computers (desktop and notebook PCs) as both the largest electronic systems market and the largest end-use application for ICs in 2013 for the first time ever. 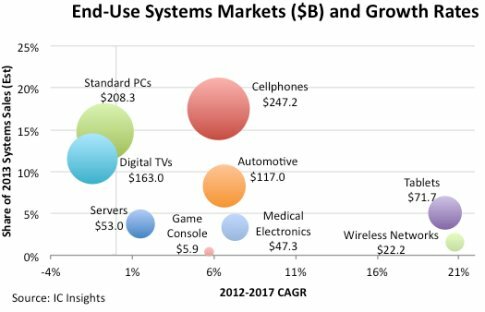 Figure 1 compares the relative market sizes and projected growth rates of nine major systems segments among nearly a couple dozen end-use electronic product categories covered in the 2014 IC Market Drivers report. These nine market categories represented an estimated two-thirds of the total production value of all electronic systems in 2013. Cellphones will overtake standard personal computers (desktop and notebook PCs) as the largest electronic systems market for the first time in 2013. Cellphones are expected to account for 18% of worldwide electronic systems sales ($247.2 billion) versus standard PCs with 15% ($208.3 billion) of the total in 2013. In 2012, PCs represented 17% of systems sales while cellphones were about 16% of the total, based on the new report’s market analysis. Cellphone sales are projected to rise by a CAGR of 6.3% in the 2012-2017 period, while standard PC revenues are expected to slump by an annual rate of -0.7%, partly due to the growing popularity of tablet computers and greater use of smartphones to access the Internet. Figure 2 shows the market sizes and projected growth rates of IC sales for 10 major end-use systems categories, based on data and five-year forecasts in the 2014 IC Market Drivers report. After dominating IC sales for most of the last two decades, standard PCs will take a back seat to cellphones, which are projected to become as the largest application for ICs in 2013. The 2014 IC Market Drivers report estimates cellphones will account for 24% of IC sales in 2013 versus 22% in 2012, while PCs will represent 22% of the total in 2013 compared to 25% last year. IC sales for standard PCs have stalled out while cellphone IC revenues are projected to grow by a CAGR of 12.9% between 2012 and 2017. Among these 10 end-use market segments, IC sales growth is expected to be the strongest in systems for wireless networks (a CAGR of 17.9%) and tablet computers (a CAGR of 15.3%) in the five-year forecast period of the new IC Market Drivers report. 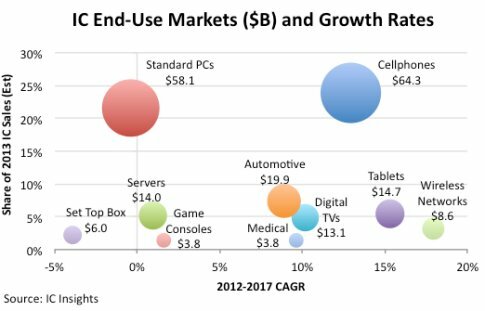 IC revenues generated by these 10 end-use systems categories will represent an estimated 77% of total integrated circuit sales worldwide in 2013.